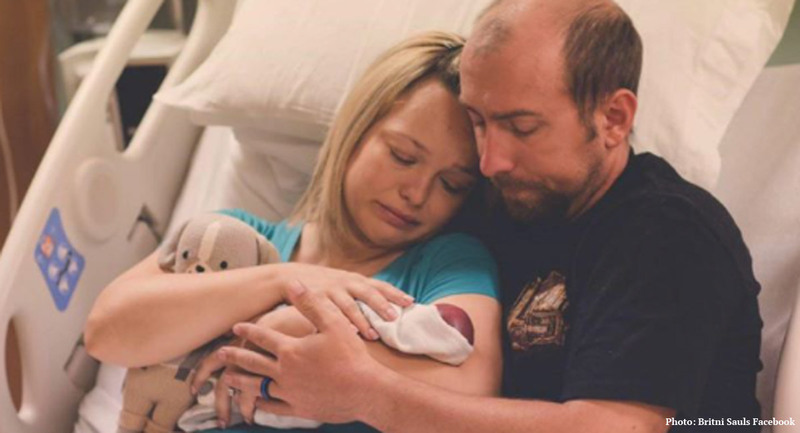 Just under two weeks ago, Britni Sauls delivered her baby boy, Ollie, at just 22 weeks. In an emotional Facebook post, she spoke candidly about her difficult experience — and how it gave her the strength to no longer be silent about abortion. Ollie’s delivery brought home a terrible reality for Sauls. I am ANGRY, but not at God because I trust in His plan. I am ANGRY at every single person who shouts about the rights of this group or that group but is silent about the rights of these precious little lives who are killed every single day because someone chose to be irresponsible. I am ANGRY that so many women think this is totally okay. These babies need someone to be their voice and while I’ve always been silent about abortion until now I will no longer do so. She noted that babies even younger than Ollie, at just 21 weeks, have survived and are thriving — and that babies just like Ollie are able to legally be aborted. Did you know there’s an abortion clinic being opened in central Georgia? The first one to open in this area. It’s in Macon on Walnut Street. Do you know this clinic will allow abortions up until 24 weeks? How the hell is this even allowed? … My baby kicked and responded to everything we said to him. His daddy would talk to my belly every single morning and every single night and he would kick in response. He responded to water hot or cold, shower, bath, or pool he hated it! He would move as far as he could up my belly to get out of it. He didn’t like me sleeping on certain sides and he would let me know. Just because they aren’t born yet, doesn’t mean they can’t feel anything. I’m almost certain his last violent crazy kicks was him trying to free himself from an umbilical cord that had become wrapped three times around his little neck. My baby would still be here if it wasn’t for a freak umbilical cord accident. “I will no longer be silent on abortion,” she concluded. While Sauls was critical in her post about women who have abortions, the reality is that for many of them, it isn’t a freely made choice. A disturbingly high number of women are coerced into abortions; even Alan Guttmacher, former president of Planned Parenthood, claimed that around 30% of abortions are the result of pressure and coercion. Many other women resort to abortion because they feel they have no other choice; because they fear losing their job, their education, their housing, their future, their family. They resort to abortion not because they hate their children, but because they are not being given the support and resources to empower them to choose life. Our culture could, if it so chooses, both affirm the humanity of preborn children, and empower women by building a society friendly to children and families.